On Sale Now! Save 10% on the Arlen Ness Black Micro Mini Oval Mirrors for Harley-Davidson - 13-412 13-413 by Arlen Ness at Two Wheel Tek. MPN: 13-412 13-413. Hurry! Limited time offer. Offer valid only while supplies last. You are buying a pair of Arlen Ness Black Die-Cast Micro Mini Oval Mirrors. 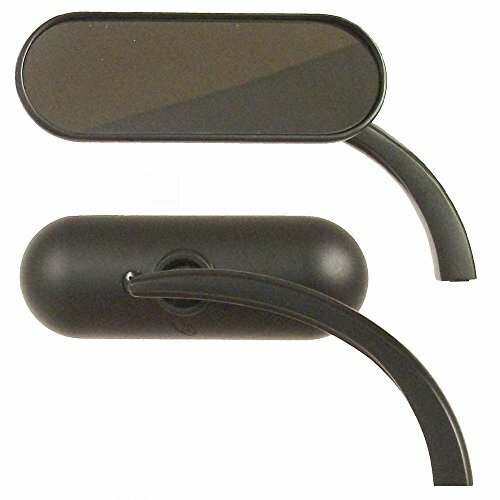 These feature convex mirror glass that measures 4 1/2'' W x 1 1/2'' H.
You are buying a pair of Arlen Ness Black Die-Cast Micro Mini Oval Mirrors. These feature convex mirror glass that measures 4 1/2" W x 1 1/2" H. Mounting studs are included. Arlen Ness Black Die-Cast Micro Mini Oval Mirrors add style to your Harley. Features a convex mirror glass that measures 4 1/2" W x 1 1/2" H.
If you have any questions about this product by Arlen Ness, contact us by completing and submitting the form below. If you are looking for a specif part number, please include it with your message.